Previously, I posted about my roleplaying experiences at Fastaval. Well, after discussing it with the other judges, I’ve decided to give you a look back at my board gaming experiences from Fastaval – that is, my experience playing some of the games designed for Fastaval. I played four very different games, at varying degrees of completeness. I also played two games before Fastaval, but I’ll skip those here. And so, I give you here below my four boardgaming experiences from Fastaval. 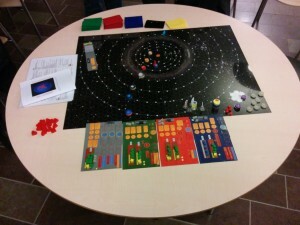 The first game I played was Cosmonaut Crisis (Kosmonauter i Krise in Danish). You are playing a story similar to 2001: A Space Odyssey – if it had been written in Soviet Russia in 1969. It is a four player semi-coop in the vein of Dead of Winter, in which you and the other players crew a spaceship on a mission to Neptune. You also have a mission that the team is supposed to complete on the way – only, in true Cold War style, you don’t actually know what the mission is at the start of the game. And not everyone may actually want to complete the mission – as in Dead of Winter, everyone has a secret identity with a set of particular objections they must complete to be counted as a winner at the end of the game. This can include completing the mission, but might also be to make the mission fail – filthy capitalists have infiltrated the ship, and while they want to get to Neptune, they don’t want to noble communists to prevail. I had a lot of fun playing the game. I was a good communist robot, who wanted the mission to succeed – and then a bit more. Unfortunately, another player was a traitor, and we had a conflict running through most of the game, with him trying to scupper the mission, and me trying to achieve my goal. Come the last turn of the game, it looked like the mission would succeed, but not enough for me to win. That would mean that the traitor and I would “make it”, while the other two players would win. An acceptable outcome to me. But at the last moment, he got a card that allowed him to change his role to one that would win along with the other two – leaving me with a choice between being the only one to only “make it”, or making the mission fail so that we all just made it. This was at once a great culmination of an epic play experience, and a bit of an anticlimax. 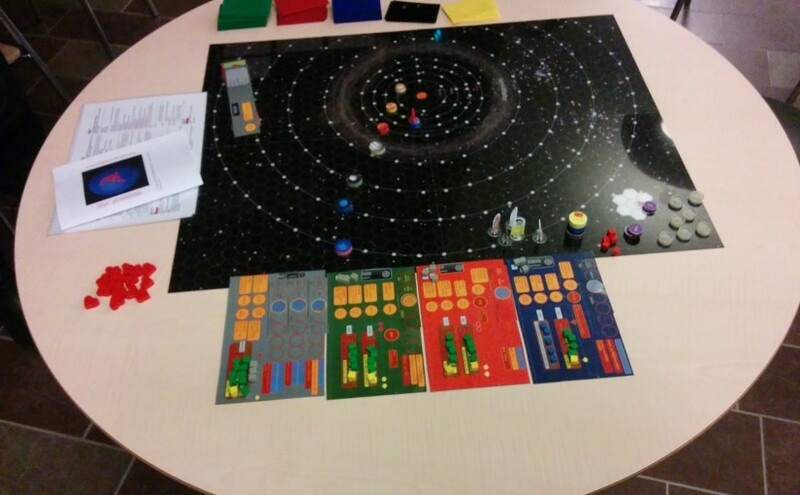 Cosmonaut Crisis is a very rough game, and it needs a bit of polishing. Having said that, it’s a really interesting game that tells a very interesting story and provides a great vehicle for semi-coop paranoia-play. A brief example of what I mean by that: There are three central actions that you’ll want someone picking most turns. One helps you steer the ship, one helps you control the crises hitting the ship, while the last controls the communication coming in from the Kremlin. Each involves one player drawing three cards and selecting one to play, discarding the others without showing them to the others. This provides ample opportunity for players to select cards that further their own agenda, which means the other players will easily become suspicious of your motives. On the other hand, if nobody selects that action, the top card will be simply be flipped over and executed. And so you’d rather have a human player you can’t quite trust make a choice, rather than just flipping a potentially horrible card at random. This was probably my best play experience of Fastaval (even when counting in the scenarios), and I hope the designer polishes the game some more. It’s definitely a game I’d like to see in a finished version. Thursday morning it was time for Stranded. It’s a fantasy 4X game about a bunch ships from competing factions washing up on an island, and trying to gain dominance over the others, and possibly being the first to get in touch with their nation at home and getting them to come help them out. The basic mechanic of the game consists of exploring the island with your hero to gain resources, building up your city to create an engine, and working your way towards one of four different victory conditions. The natives of the island are an important part of the game. They will start off friendly and willing to trade, but as the game goes on, they become angry, and start attacking the players. An interesting mechanic that unfortunately was not quite developed enough for my tastes. This was the most unfinished game I played at Fastaval this year. Unfortunately, the rules were a bit difficult to follow, and the designer was busy trying to help the other people playing the game. That meant that we spent a lot of time trying to figure out how the game worked. After about an hour and a half, one person at the table had to leave and so we stopped the game, about a fifth of the way through. The game had promise, though. Once we got to playing, I could feel the spirit of the game coming alive. It reminded me of computer games like Heroes of Might and Magic or Colonization, and the mechanisms were an interesting mix of Eurogame engine building and Ameritrashy fighting and adventuring. I have a weak spot for hidden identity games. Also, I have a certain interest in Shakespeare. So of course a hidden identity game about fairies fighting over Shakespearian characters caught my eye. In the game, you will play different fey creatures belonging to either the summer court of Titania or the winter court of Oberon, or the renegade Changeling who belongs in neither court. All characters have different emotions (represented by symbols on the cards) that they value. At the end each character will score the mortals they have acquired, then the scores of all characters in the same court are added together and the court with the most points will win. The currency in the game are “favours” owed by one of the characters. When someone has placed a bid, other players can offer give them a favour to try to make them withdraw their bid. If they give them a favour belonging to their character (so if you give the Satyr a Satyr favour) they must withdraw. Otherwise, they may still withdraw if they so choose. No matter what, they keep the card. I really like this game. It’s in the difficult end of the spectrum for these kinds of games, but I like that. It’s challenging, and I find it very engaging. The economy of the game is very tight, and runs very smoothly. It’s also pretty much a finished game. Which is good, because you can buy it on GameCrafter. I hope it gets picked up by a publisher, because it deserves to be properly published. The last game I got to play myself was a game of Cthulhoid sorcerers. You have cards containing a bunch of words, and you are trying to assemble the right words to cast a certain spell. The twist is that you don’t get to look at your hand during your turn. Also, every time you cast a spell, you gain powers and madness. The powers help you, but the madness makes casting spells more difficult, for instance by requiring that you stand up after saying certain syllables, by mandating that you laugh after each word, or maybe by putting you on a timer or allowing someone else to mess with your cards. The idea is quite good: get people to say weird, Cthulhu-esque words and mix in a memory aspect to make it seem more like madness. Unfortunately, I didn’t really like the way it worked. The memory aspect played a relatively minor role in the game, and didn’t pose enough of a challenge. The madness cards were good, but not really enough. Also, the scoring was weird, and meant we finished the game very quickly. I would love to hear you thoughts about the two games that you played before Fastaval. What’s the reason to leave those two out?